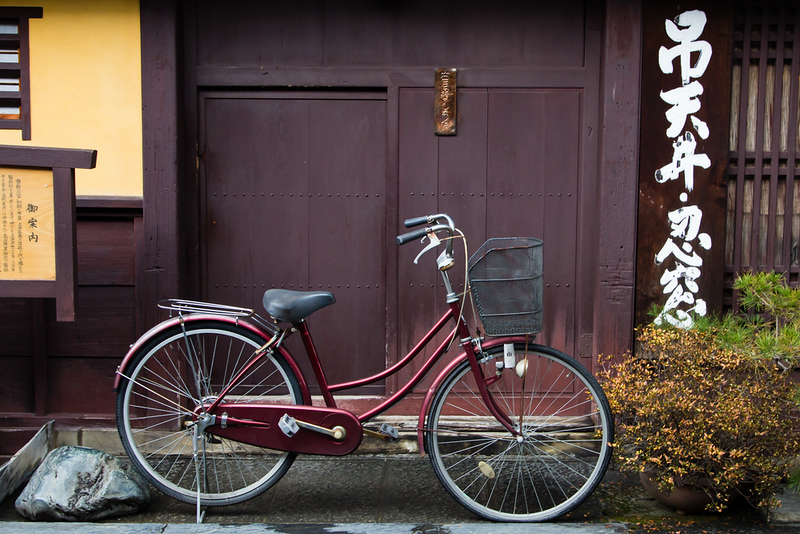 Takayama is a small city that can be easily explored on foot but you can also rent a bicycle. Nearby sights are accessible by bus or rental cars. Here’s everything you need to know. If you only intend to explore the main sights in the city center, you don’t have to worry about getting around: The city is so small that it’s best explored on foot. However, if you want to cover a lot of ground quickly or visit a sight outside the city center like Hida no Sato, then a bicycle is a good idea. And, if you want to visit places around Takayama, like Shirakawa-go, Kamikochi, Shinhodaka or Kamikochi, then you can choose between buses or rental cars. Here are the full details. Walking is the best way to explore Takayama City. You can reach most of the sights on my Things to Do in Takayama page within 30 minutes or less by walking from Takayama Station. The only place in Takayama City that takes a bit more time is Hida no Sato, which is best reached by bicycle, local bus or taxi (see following sections). Takayama buses, both local and long-distance, operate from the bus station right outside Takayama Station. As I said above, you can explore Takayama City on foot. The only sight that is too far to walk is Hida no Sato, which can be reached by the Sarubobo Bus (I didn’t make up that name!) that leaves from Takayama Station about once an hour and costs Y210/Y110 for adults/children. Another bus, the Machinami Bus, does a loop of the main sights inside the city for the same price. There are several interesting places around Takayama that you might visit by bus, including the thatched-roof village of Shirakawa-go, the hiking center of Kamikochi, and the onsen and cable car of Shinhodaka Onsen. Buses to all these destinations operate from the bus terminal outside Takayama Station. There is a handy information window there where they can help with time and ticket info. You can hire taxis from the taxi stand right outside Takayama Station. A ride to a place like Hida no Sato will cost around Y1,000. If you have three or four people, a taxi can also be a reasonable option to places like Shirakawa-go, Kamikochi, Shinhodaka Onsen or Kamikochi.